You can send your IIS logs to Loggly, allowing you to do analytics, dashboards, alerts, and more. For example, you can see the top requests to your site. You can use the free and open source Nxlog tool to retrieve these logs and send them to Loggly. It will extract each individual field in the IIS logs, and then convert it to JSON so Loggly can parse and index each field. You can also use Snare or Syslog-NG for Windows. This guide was written for Windows Vista or later in 64-bit, the latest version of nxlog in the default installation directory, IIS in the default directory, and can send TCP events out on port 514. It assumes the default log format for IIS, which is the W3C Extended Log Format. It was tested on Amazon EC2 with Windows_Server-2008-R2_SP1-English-64Bit-SQL_2008_R2_SP2_Express-2013.11.13 (ami-1653c826). For alternatives, please see the Advanced Options section. Download the latest version of nxlog. It’s probably easiest to choose the Windows msi file which includes an installer. Open your nxlog configuration file. Replace the entire configuration file by pasting the following, and replacing the variables below. If you use a custom logging directory, change the path to your custom directory. If you have multiple sites, create one input module for each site and add all of them to the route path separated by commas. ## See the nxlog reference manual about the configuration options. # Create the parse rule for IIS logs. You can copy these from the header of the IIS log file. ROOT and ROOT_STRING: If you are in 32-bit Windows, uncomment the top root path on lines 8 and 9 to use the 32-bit program files folder then comment the two below. Note: If you want to include the default windows eventlog and internal logs with your IIS server logs then you can include these modules to the root path at the end separated by commas. Version 7 is missing a field which we need to enable so the parser works correctly. Open Run prompt and type the following command and press enter. 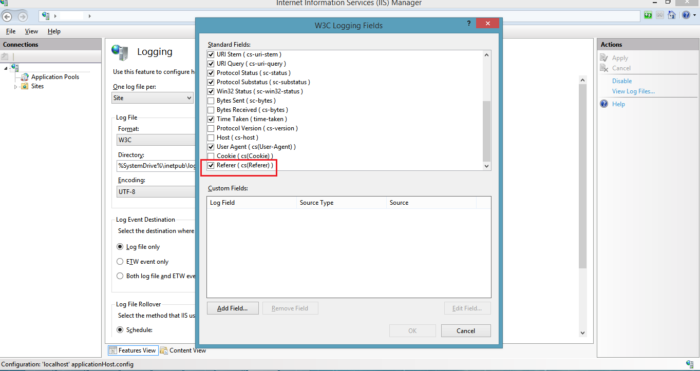 This will open IIS Manager. Click on Logging and open Select Fields window. Check the Referer field checkbox in the W3C format and click OK.
View a webpage on your IIS server to generate a new log entry. It’s configured to not send old events. Search for your IIS logs in Loggly using the app name or tag. Click on one of the logs to show a list of JSON fields (see screenshot below). If you don’t see them, please check that you are using one of our automatically parsed log formats. Get value from your IIS logs by solving problems and proactively preventing them. These guides are written for Apache web server, but the examples and use cases are also relevant for IIS. Search or post your own IIS logging or log file questions in the community forum or read more about what IIS is here. Search or post your own IIS manager and logging questions, or other topics, such as your Windows server, file format, or how to configure logging with your setup in the community forum.